San Francisco and Vicinity Issued by the Southern Pacific. 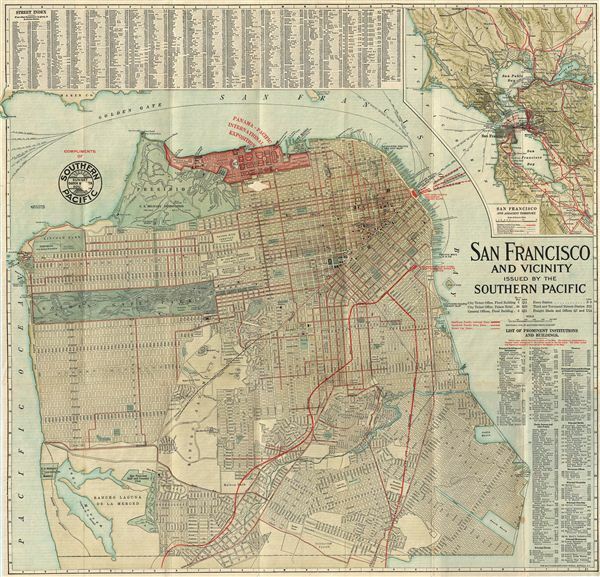 An attractive pocket map or city plan of San Francisco, California, issued in 1914 by the Southern Pacific Railroad. The map covers the northern part of San Francisco Peninsula from Bellevue Street and Lake Merced northwards. Offering impressive detail, this map identifies all streets and numerous parks and public buildings, even the individual links in the San Francisco Gold and Country Club are noted. Golden Gate Park and the Presidio Military Reservation are particularly well rendered. At the northern top of the map the lands reserved for the Panama-Pacific International Exposition are marked and highlighted in Red. The Panama-Pacific International Exposition (PPIE) was a world's fair held in San Francisco between February 20 and December 4 in 1915. Ostensibly the fair was intended to celebrate the completion of the Panama Canal, but it was also opportunity for San Francisco to showcase its recovery from the 1906 earthquake. The fair was constructed on a 635 acre site (shaded in red) along the northern shore now known as the Marina District. Of course, at this time The Golden Gate and Oakland Bay Bridges have yet to be built. Street and building indexes surround the map proper. A more general map of the entire San Francisco Bay region appears in the upper right corner. The Southern Pacific railroad contracted the Matthews-Northrup Works publishing firm of Buffalo to prepare and print this map. Good. Backed on archival tissue. Printing on verso. Margins slightly trimmed. Some loss at original fold intersections - see image.